London [UK], Sep 25 (ANI): Croatian captain Luka Modric has beaten Portuguese striker Cristiano Ronaldo and Egypt forward Mohamed Salah to be crowned as the Best FIFA Men's Player of the year. "The award caps off an incredible year for the 33 year old Croatian, who won his fourth Champions League title with Real Madrid in May, before leading his country to the 2018 World Cup final," reported Goal.com. 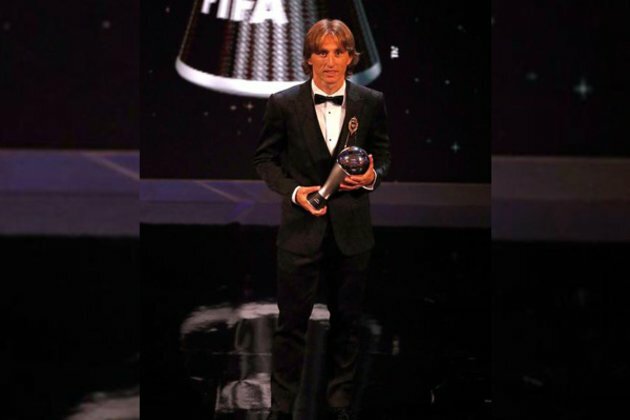 Modric won the Golden Ball at the World Cup and was also named UEFA Men's Player of the Year last month. The Croatian footballer dethroned his former Real Madrid teammate Ronaldo, who had won the award twice before. Liverpool star Salah was rewarded with the Puskas Award for best goal of the past year for his strike against Everton in a Premier League match at Anfield. Didier Deschamps, who led France to a World Cup glory, was crowned Men's Coach of the Year. Belgian goalkeeper Thibaut Courtois won FIFA Goalkeeper of the Year for his performance at the World Cup.